Xenophon’s SA Best predicts 90% renewables in the state by 2030. Although it is not a target, the rush to embrace renewables in South Australia highlights how state-based Liberal Party and the Federal Coalition are being left behind. Nick Xenophon’s newly formed SA Best party says that having 90 per cent renewable energy (i.e. wind and solar) in South Australia by 2030 is perfectly feasible. But it stresses that this is not a target, unlike Labor’s 75 per cent ambition for 2025. The comments by SA Best’s environment and energy spokesman Graham Davies, and you can read more here, underlines the extraordinary developments in the South Australian energy debate, where it is now clear that South Australia’s push into renewables is unstoppable, and should not be stopped. It is a dramatic contrast to the tone of the debate that is being had at federal level, but probably not surprising given how far ahead South Australia is to the rest of the country, and the world. In South Australia, the share of wind and solar is already at 50 per cent, and these technologies are popular. Contrast this to the debate in the coal states on the eastern seaboard, where even a 20 per cent renewables target (hydro included) has the conservatives reaching for the smelling salts. SA Best’s Davies says it is clear that wind and solar are the cheapest technologies. He says the difference between SA Best and Labor is over the need for any sort of target. 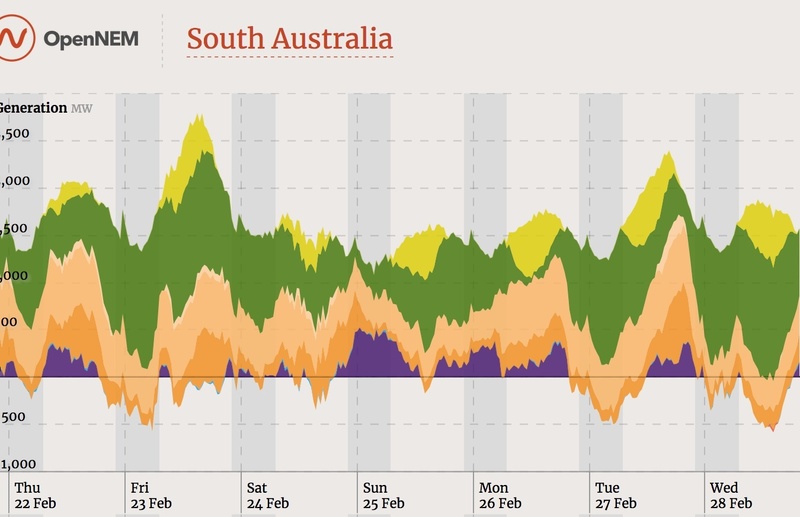 South Australia, as mentioned, is already generating 50 per cent of its needs from large-scale wind and rooftop solar, and has some 500MW of new large-scale wind and solar capacity under construction, along with a handful of storage projects, and a lot more in the pipeline. Labor has sought to make a new benchmark by outlining the 75 per cent target by 2025, which follows a slew of announcements for new solar farms with battery storage, a Tesla virtual power plant, further incentives for household storage, and investments in hydrogen and support for pumped hydro. In reality though, Labor’s target – while seemingly ambitious – reflects little more than the new wind and solar farms which are being built now, along with 150MW solar tower at Port Augusta and the 1GW of solar and storage that UK billionaire Sanjeev Gupta says is essential to save Whyalla’s steel industry. But, as Weatherill explained in this Energy Insiders podcast last week, having the door open to investment is as important as having a target. SA Best is now keen to show that it, too, is a supporter of wind and solar, something that many would have good reason to doubt given Xenophon’s speeches and actions in the past, and the unknown quality of his candidates in the March 17 poll. Xenophon played a key role in getting the federal government to support the Port Augusta solar tower and storage plant, but he is best known as an opponent of wind energy, having supported the creation of the Wind Commissioner and new research into the supposed health impacts of wind farms. Those investigations came to nought, at least in finding any adverse impacts, and the Wind Commissioner has struggled to find anyone who has a legitimate and abiding complaint. Davies is an engineer and energy consultant who has worked on wind projects and has been a major critic of the pricing of the Coober Pedy renewable-based micro-grid, for which he blames Labor. He is contesting the seat of Waite, vacated by former Liberal leader Martin Hamilton-Smith, who defected and became a minister in the Weatherill government and has decided to retire from politics. “My personal prediction is that this (the cheap cost of wind and solar) will result in around 90 per cent renewables by 2030, but this is a prediction, not a target,” says Davies. Even the Liberals are trying their best to look like they support renewables, announcing plans for $100 million grants for household storage. But they refuse to endorse a state-based target, to keep in line with the Liberal-National policy in Canberra, and their policy document makes multiple references to the need for “baseload”, when South Australia’s problems are more what to do about demand peaks, not troughs. But what exactly do the Liberals – both state and federal – propose to do to stop more wind and solar from rolling out? Tell Gupta that he can’t build solar to save the jobs at Whyalla? The situation appears untenable. But federal energy minister Josh Frydenberg continues to play cheap politics, describing the investments in wind and solar (which the state Liberals cannot and won’t stop) as reckless. It shows a complete disconnect between Coalition rhetoric and the reality on the ground. Frydenberg railed against “uncoordinated, unilateral state actions”, and sadly these thoughts were echoed by the head of Energy Security Board, Kerry Schott, at a forum on Monday. Frydenberg sought to justify his position by quoting the Business Council of Australia, the notoriously anti-renewable Australian Chamber of Commerce and Industry, and the Grattan Institute, which is not regarded as a particularly progressive think tanks (at least on energy). “How long will it take Bill Shorten to follow Jay Weatherill’s example in adopting another reckless, ideological and ill-planned renewable energy target?” Frydenberg asked. But Frydenberg’s position is being undermined the more we learn about the Coalition’s pet projects, the National Energy Guarantee and Snowy Hydro 2.0. Both are effectively useless without high ambitions for wind and solar. The response from energy utilities small and large, bankers, financiers and others at the ESB forum on Monday was that the NEG would likely reduce competition and push up prices, and there was little point to it if it didn’t have more ambitious emissions reduction targets. Origin and PowerShop, among others, wanted stronger emissions targets – the sort that would take the country closer to Labor’s target of 50 per cent by 2030. There is absolutely no technology impediment to such a target. And the advice from independent parties – the CSIRO, the networks lobby the Finkel review and the subsequent study on storage – is clear: Australia has the potential to go for a high renewables grid that would not just be cleaner, but cheaper and more reliable. I think I will vote for the party with the Renewable Energy runs on the board and a 75% target thanks. Nitwit Xylophone can’t be taken seriously. The dude gave us The Wind Commissioner. The ‘WC’ ( pun fully intended ) is costing us taxpayers plenty of our hard earned and in the two plus years he has been tilting at Wind Turbines he is still to find a victim suffering from brain damage which Nitwit Xylophone said was a priority needing investigation. SA will probably be at 100% RE by 2030 anyway, with or without The Nitwit. I should go and check but I think he helped get rid of the price on carbon. Zero credibility in this space. I’ll save you the research…The Vote was 39-32 to repeal The ETS. The 32 was Labor and The Greens. The 39 was The COALition and all the crossbenchers except Xenophon who was absent for the vote…I have no idea of the reason for his absence. Perhaps someone could ask him? South Australians should look beyond this mercurial populist and make a firm decision to elect a government with policies they can trust to build a solid foundation for South Australia’s future. Meanwhile the Lazy Negative Party sounds increasingly schizophrenic – ridiculing ‘ridiculous’ renewable targets while calling for energy policy reform including storage, which only makes sense as firming for renewables. He did the same thing with the ETSA sale. Kept the idea alive for two readings of the bill and went missing for the third and final bill. Perhaps the Nitwit should rename his party…The MIA Party…MIA of course stands for ‘Missing In Action’. Joe, as I recall, Xenophon later said that in the minutes leading up to the vote to repeal the ETS, he suddenly fell ill and had to vacate the building so wasn’t able to cast his vote. I think it’s fair to say the man lacks the courage of his convictions. Thank you for that updated piece of info. I guess if you are ill, you are ill. I’ll take him at his word….did he have a Doctor’s Certificate to cover his absence I wonder. 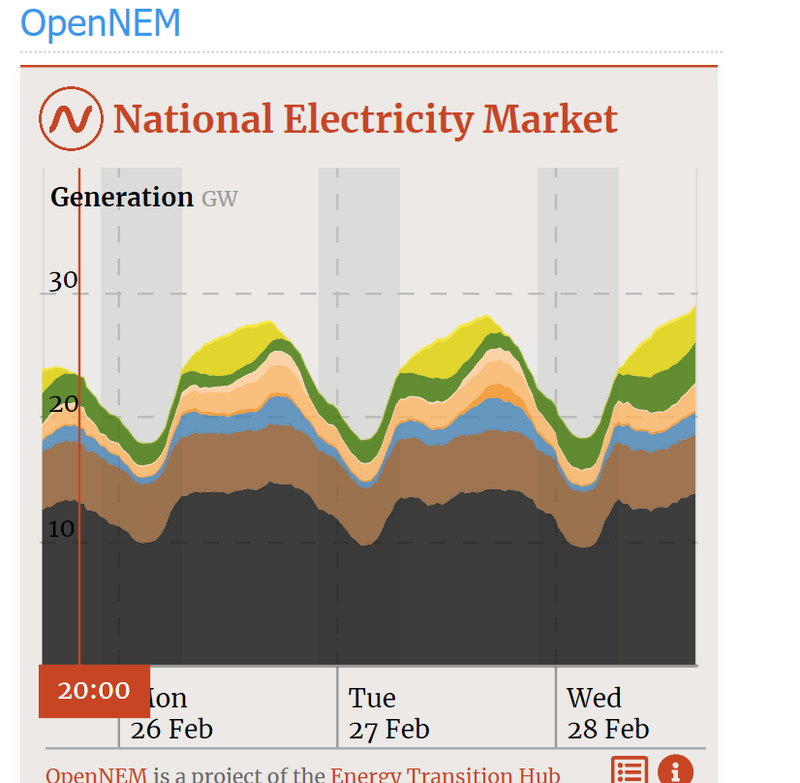 Given the interconnector and intransigence of esb, aemc and the federal COALition i imagine SA is well placed to be supplying 110%+ of its electricity needs from cheap, clean renewables. …110%plus, now wouldn’t that be something. Don’t think Nick read your email as he is now not only supporting renewables, he are discussing renewable energy targets of 75% and have said that 90% is feasible by 2030. Some expansion on Graham’s statement ‘….. the issue with the medical research …. there is no evidence, the noise thing has been resolved.’ would be handy. Name one and I might read it – unless it’s from Stop These Things. Please stick to the point you’ve raised. What are the articles? Is infrasound real? Who has measured it? What do you understand by ‘the noise thing’? Alan, it was you that raised it, and it sounded like you were an infrasound troll. I now suspect you aren’t, sorry for the assumption. Perhaps slow down a bit and read what I’ve written. There is a STT guy trolling on here at times. Andy I think you need to offer some links. I’m not an anti-wind-farm idiot. Just in case it’s not clear. In summary the syndrome is curable with $’s paid. It’s pretty clear that renewables are gathering pace in SA like a snowball rolling down a hill. Hitting anything less than 100% RE by 2025 will require putting the brakes on. The sooner they hit 100% the better. At that point SA becomes a knowledge centre, a pilot for the remaining states and the rest of the world to study and emulate. Nice fat consultancy fees await those involved along the way. That IS a cheerful prospect. And another thought, software. Everything is software driven these days. Every investment in software should be written with a view to selling it to others who encounter the same need. They are getting the spin-offs too. New battery factory maybe a new EV factory. It reminds me a little of how the eastern states moved to supremacy during the banking deregulation era. Perhaps a little balancing of economies is coming now. You reference baseload as ‘baseload’. A tiring argument. Perhaps you might want to change your image to match your (implicit) rhetoric? (Hint: Put the green stuff, or the yellow stuff at the base). Yes and that s exactly what will happen over time. And it is in SA. Then the brown and black COULD be at the top except that would not be economic would it? Barri, you seem to miss my point entirely, which was this: The conventional ordering of the energy sources (larges at the bottom, smallest at the top) gives the (false) impression that the coal does the heavy lifing, that it is the baseload that supports everything else.My point has nothing to do with economics, and everything to do with perception. I like seeing the small scale solar at the top, to me it’s really symbolic in a couple of ways. It shows how much bigger and longer the peaks would be without small solar. It like being able to show the people that say “you can’t change anything with one house” and saying “don’t tell the people that own those houses that”, it’s like the kid throwing starfish off the beach. Hmm. Double small solar (typically takes 2 years) and you eliminate nearly all imports. Double wind (typically takes 3 years) and you eliminate gas. You might want to look at SA at the same time demolishes your argument! Ray – it does not demolish my argument at all – I made no argument. I merely suggested (in effect) inverting the colors, so that green or yellow appears at the bottom – the bottom being (psychologically) the base. Whenever the black appears at the bottom it reinforces the erroneous view that it is base load. Further to my last: The original post shoudl have said ‘you reference to coal as ‘baseload’. SA interconnection capacity is relatively poor. This is by design as it turns out. And SA wants no more interconnection until renewable has been ramped up to very high levels. Well SA needs to go 100%, just so they can be an example to the negators and idiots (mainly from the East) who say it can’t be done. Then SA might, MIGHT consider improving trade with those idiot States. It certainly will be interesting to see if all the hype in SA actually fools people into investing in all these new projects. The race to the bottom is on in earnest….. The ones that generate the cheapest cleanest power available. Or change to Prosumer Jon … actually thinking about it, nah. Xenophon is ridiculous. He just made up these figures, pucked them out of the air as if this was some kindergarden play. Why does he so disrespect South Australians with his lack of research and analysis. He has never sunk lower. Well he has done some research on the Pokies and decided…Pokies are here to stay! The dude has no shame. Visionary statements? No, one only has to look at current construction and what will likely be built to see SA will hit 75% by about 2021and probably hit 90% around 2025/26. If more interconnectors are built it will nominally exceed 100%. Wetherill had better get Oakden under control, see heads roll. The report into Oakden is shocking. Vlahos was just sitting on her behind, cruising, enjoying the perks of office. Oakden could pull Wetherill down, regardless of his achievements over renewables. It could indeed. A lot of anger on ABC radio this morning about Oakden and an insipid performance by Jay – ‘I didn’t know/ask’. Reminiscent of the State Bank mismanagement and collapse which triggered the sale of ETSA. I differ from Xenophon. I think 85 per cent renewable energy in South Australia by 2035 is perfectly feasible, but that this is not a target. I used the same source – my parasitical imagination. 1) “Nick supports the conclusion that there is no discernable link of noise to health for wind energy”. 2) “I had a meeting with the noise specialists and they were technically credible. The gaping hole in the research was that they did not compare the noise of wind turbines vs coal fired stations vs gas fired power stations, which I suspect would be orders of magnitude more problematic. There funding was only for this narrow research”. As a past consultant and project manager on wind farms, I have seen things done badly, with regards stakeholder engagement and placement of turbines. Fortunately, that is in the past.